Mark Osborne, Centre for Technology Enhanced Learning, University of Lancaster, U.K.
Osborne, M. (2013). An autoethnographic study of the use of mobile devices to support foreign language vocabulary learning. Studies in Self-Access Learning Journal, 4(4), 295-307. This autoethnographic study involved the author in the dual role of researcher and subject in a self-study language learning episode. The paper describes a foreign language learning experience of using a mobile phone (Apple iPhone) word card application to learn Italian vocabulary. Data from diary entries were analysed and categorised, and the findings show that learning strategies, content, motivation and interface design are prominent themes. The significance of these themes is addressed in the discussion, and suggestions for further research are made. The findings are of value in order to inform the design, development and deployment of mobile device-based vocabulary learning resources for language learners, and are therefore of interest to language educators, mobile device materials designers, developers and publishers, as well as researchers. There has been a resurgence, over the last two decades, in the appreciation of the centrality of vocabulary learning within any language learning scheme (Nation, 2001; Schmitt, 2000; Schmitt, 2010). There has also been a concomitant level of research activity, fuelled by developments in computational linguistics (Schmitt, 2010) into how foreign language vocabulary can best be learned and what aspects of (English) vocabulary should be included in any learning scheme (Folse, 2004; Nation, 2001). Vocabulary learning can be placed into two complementary categories: incidental and intentional (Nation, 2001). Incidental vocabulary learning can happen when the explicit focus of the learning task is meaning-focussed, e.g. when engaging in reading or listening for general comprehension or pleasure. One of the limitations of incidental vocabulary learning is that it is slow, haphazard and requires large quantities of text to be processed to ensure adequate exposure (Nakata, 2008). There are also considerable difficulties in guessing meaning from context and learners need to be familiar with at least 95% of the words in a text in order for them to be able to focus on meaning (Nation, 2001). Intentional vocabulary learning is where attention is explicitly focussed on learning (typically new or unfamiliar) vocabulary items. Intentional learning from word cards, using first language (L1) translations of second/additional language (L2/L3/…/Ln) target items on opposite sides of cards as prompts for recall, has been shown to result in learning that is both fast and secure (Nation, 2001; Folse, 2004). Nation (2001) notes that computer-assisted vocabulary learning can create the conditions required for effective vocabulary learning, especially when it comes to scheduling when best to re-visit items being learned. This concurs with Sökmen (1997), who maintains that vocabulary learning software needs to be designed to take full advantage of the interactive medium as well as being underpinned by sound vocabulary learning theory. Successful learning outcomes, however, are dependent on the learner persevering with the learning task and various factors can influence this. Allum (2004) provides some evidence that the interactive ability of computer-based materials to assess responses and provide immediate feedback can motivate learners and encourage them to work harder at tasks and attempt them more frequently compared to paper-based alternatives. Whether that motivational effect will continue given the increasing ubiquity of interactive devices is a moot point. The last 5-10 years have seen an increase in the adoption of mobile devices for learning (Belshaw, 2010). Kukulska-Hulme (2009) notes that mobile technologies are starting to have an impact on learning in general, and, more specifically, language learning. The typical modern mobile smartphone touch-screen is similar (slightly larger) in size to the word card size of “around 5 x 4 cm” recommended by Nation (2001, p. 303). Smartphones can also support rich graphics, high-quality audio, video, and a high degree of interactivity – they are essentially handheld computers. In addition, smartphone manufacturers are building ‘ecosystems’ that allow (educational) applications (‘apps’) to be downloaded directly to the phone. Not surprisingly, there have been a number of mobile apps published which are designed to assist foreign language vocabulary learning using a word card approach (Moore, 2011). However, despite the growing adoption of mobile-assisted language learning (MALL), Stockwell (2007) notes that “there is very little research that looks at how learners themselves use and perceive language learning activities” (p. 366) and Ros i Solé (2010) argues for an ethnographic approach to researching MALL that “has as its focus the learner experience rather than an evaluation of his/her learning” (p. 137). The aim of this study was to gain insight into the experience of learning vocabulary, using word cards; thus, placing the author in the position of a language learner. This was so that the author could experience first-hand what it is like to use an interactive word card-based vocabulary learning app on a mobile device, having chosen to learn Italian ab initio. The methodological research approach adopted was autoethnography. Autoethnography is an ethnography which is focused on the self, where the author of the study is both the informant (‘insider’) and researcher/analyst (‘outsider’) and the investigator builds an ethnographic description from an analysis of their own behaviour. Autoethnography is not without its detractors nor is it free of limitations or controversy. McIlveen (2008) acknowledges that autoethnography’s most significant limitation is its epistemological status due to the researcher’s dual roles as both informant and investigator. Holt (2003) also recognises that the controversy associated with autoethnography is partly caused by the exclusive reliance on the self to produce the research. O’Byrne (2007) notes these criticisms, but frames them within the context of differing paradigms; thus, while the study of self and the use of self-reflective data would be deemed unscientific because it violates criteria of rigour, from a post-positivist perspective, within an interpretive paradigm, other criteria apply. Etherington (2004), while satisfied that any criticisms of autoethnographic methodology have been addressed, warns that these criticisms could be held to be valid if the researcher does not approach the task with the requisite skills and without understanding its purposes and their own motivations. Finally, Cunningham and Jones (2005) point out that if done well, autoethnography can provide insights that with other approaches might be too subtle to elicit: “the challenge is to view oneself objectively, to see one’s own worldview as freshly as possible and to then interpret the identified experiences in the light of applicable theory” (pp. 2-3). The motivation for this study was to inform the author’s professional practice as an interactive materials designer and developer. I am a language educator (English to Speakers of Other Languages), currently involved in the design and development of interactive materials (computer and mobile-based) to support vocabulary learning and have research interests in the field. A native English (L1) speaker, I am fluent in modern Greek (L2), which was learned as a second language in adulthood. The first task for the researcher-subject was to identify suitable resources to use for Italian (L3) vocabulary learning. I had access to an Apple iPhone 4 for use in the research and so this meant a search for a suitable word card app in the Apple App Store via iTunes. An app was selected based both on the developer’s description and on user reviews since there were many similar apps to choose from. 3. See the card with L1 on the front and try to recall the L2 – then flip the card to see the L2 on the reverse and tap ‘Yes’ or ‘No’ according to whether one was correct. Correct answers increase the card’s score, incorrect answers decrease it. All cards have to reach a score of 7 before a set is completed. The app was used on a daily basis (usually 2 or 3 times a day for 10-15 minutes at a time) and various aspects of the experience, both during/whilst learning, and retrospectively (immediate and delayed), were recorded in a diary (paper-based and electronic). The aspects of the experience recorded were not predetermined, but were allowed to emerge in as natural a way as possible. The app was used (and the experience recorded) over a two-week period, which proved sufficient to gain some insight into the initial stages of beginner-level vocabulary learning using digital word cards (although not sufficient time to learn much Italian vocabulary). The diary entries were subjected to an iterative thematic analysis to identify key categories and themes, using an approach adopted and simplified from Fereday and Muir-Cochrane (2006). This involved placing each diary entry (or part of entry thereof) under a code label (category) heading in a word-processing document. Fereday and Muir-Cochrane define a “good code” as being “one that captures the qualitative richness of the phenomenon” (2006, p. 4). The first instance of a phenomenon had a code label created to reflect its content and the entry was placed under it. Consequent entries were then placed under an existing code label, or had a new code label created for them and were placed under that. This procedure continued until the last entry was processed. The code labels were then reviewed to determine if similar ones existed that could be subsumed under others. For example, “frustration” was subsumed under “motivation”; “memory and retrieval” was subsumed under “learning strategies” to become “learning strategies, memory and retrieval”. This process was repeated until a stable set of themes emerged. A prominent strategy was a) the keyword technique: [diary entry] “using mnemonic imagery to help remember”. This involves finding an L1 word that sounds like the L2 word being learned and then forming a mental image combining the meaning of both words. This technique is well documented in the literature (Folse, 2004; Gu, 2003; Nation, 2001; O’Malley & Chamot, 1990; Oxford, 1990; Schmitt & Schmitt, 1993). Table 1 illustrates some examples of the use of the keyword technique taken from diary entries. It is interesting to note the use of Greek (L2) as well as English/Greek (L1/L2) combinations to support the learning of Italian (L3). Also interesting is the fact that b) Greek and Italian cognates were also used: [diary entry] “cognates helping (L1 & L2) e.g. Sabato (Saturday) very similar to Greek Σάββατο (savato)”, which is another strategy noted in the literature (Thornbury, 2002). However cognates were also seen to interfere with learning on occasion: [diary entry] “cognates interfering, e.g. 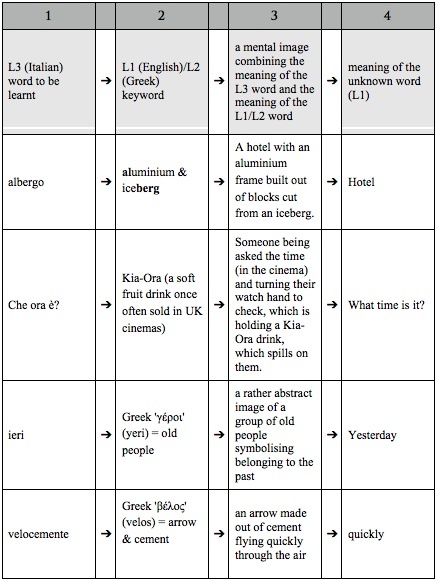 carte (card) and Greek κάρτα / karta – using Greek karta rather than carte“. Other within-language interference was also noted: [diary entry] “confusing similar sounding forms”. Interference from semantically related items was noted [diary entry] “experiencing interference between items of similar semantic meaning, e.g. ‘I’d like…’, ‘Can you…’; days of week”. This form of interference has been demonstrated by Warring (1997), who provides clear evidence (perhaps counter-intuitively) that initial learning of words from the same semantic sets (e.g. all the colours together) can actually impede learning because learners confuse words within the set with each other (e.g. recalling the word “red” for the colour green). This phenomenon can be mitigated by the choice of content (i.e., avoid introducing items in semantically related sets). There was a significant difference in difficulty experienced between c) productive recall (being promoted with the meaning and recalling the word) and d) receptive recall (seeing the word and recalling the meaning) tasks: [diary entry] “recognition OK; struggling with production of some items, particularly phrases”. Nation (2001) reports existing research reflecting this finding and suggests that receptive learning should be performed first. There was also a marked difference in difficulty experienced between items regardless of whether the task was receptive or productive: [diary entry] “finding some items are substantially more difficult [to remember] than others”. No explanation or obvious pattern for this can yet be found. It did not seem to be dependent on length of word or phrase, which agrees with Thornbury’s observation that “long words seem to be no more difficult to learn than short ones” (2002, p.27). In Step 1 of the learning in the app, the Italian and English words are presented together and the Italian word spoken, but reading and hearing the words spoken at the same time was [diary entry] “disconcerting”; [diary entry] “closing eyes so as not to read words before hearing them”. There is some explanation for this offered by Mayer (2001), who posits a cognitive processing model (not specifically for language learning) with evidence that supplying written and spoken text simultaneously can overload channels and impede learning. Of course, e) repetition is acknowledged as playing a key role in memorising words (Nation, 2001; Thornbury, 2002), but is usually referred to in the context of reading, writing or speaking. Access to a ‘play audio’ button facilitated aural repetition: [diary entry] “playing (audio of) words and phrases repeatedly, 10/20/30 times (massed repetition)”. Nation (2001) cites research that suggests oral repetition can enhance retention; however, I used f) silent rehearsal here [diary entry] “internalising pronunciation rather than speaking aloud (would recording facility help?)”. I found that the experience is heavily dependent on the quality of the app used. The didactic approach used in the app here was limited and fairly unsophisticated (e.g., no facility for the program to automatically support expanded rehearsal via a programmed algorithm). There was often a degree of uncertainty about how best to do tasks: [diary entry] “not sure whether to learn spelling or pronunciation”; and a general feeling that not enough thought or planning had gone into designing the content and learning experience: [diary entry] “don’t have much confidence in choice of words/phrases and where they are leading”. It would have been useful to have been able to edit or modify the content: [diary entry] “felt need to personalise content”. For example, [diary entry] “essential information is left out of prompts (e.g., if I wish to say ‘I am American’ – there is no indication of which gender is required for the response; same for size (shoes or clothes? )” illustrates frustration at learning two different Italian words for ‘size’, depending on context, but the prompts for recall not reflecting the distinction and simply displaying ‘size’. These may seem minor irritants but their ability to interrupt learning was disproportionately large. Some words (for whatever reason) can be much harder to learn than others and it would have been useful to have had the facility to exclude these from easier-to-learn words and to be able to treat them separately: [diary entry] “would like to put some items in a ‘difficult bin’ and get on with new easier items”. Motivation was a key issue for me and, despite Allum’s (2004) assertion that interactivity and feedback can enhance motivation, it is hard to accept that learners would persevere for any meaningful length of time with this app. Proportionally, there were a large number of journal entries relating to boredom and frustration: [diary entry] “tedious, lost concentration”; [diary entry] “frustrated by the some of the longer phrases, really hard to remember”. This may partly be due to the fact that the initial learning of new vocabulary can be very hard to achieve (certainly for me), but also that the instructional process used in the app was repetitive and lacking variety: [diary entry] “[learning words] very hard to do”; [diary entry] “bored and frustrated with some difficult to remember items”; [diary entry] “would like more variety in exercises”. At times, even dishonesty was resorted to: [diary entry] “found myself cheating [tapping ‘yes’ I understand] out of boredom and wanting to move on”. I also perceived my feelings of frustration – and the resultant negative effect on motivation – as being due to a sense that not sufficient learning was being achieved: [diary entry] “need to feel learning more”. It is quite possible that this was a result of requiring productive recall too early in the learning process, and as Schmitt (2010) notes, vocabulary learning is a gradual incremental process. While the device itself (Apple iPhone 4) was a convenient tool to use, the actual interface of the app interfered at times (e.g., varying button positions to play audio): [diary entry] “interface irritating me (button positions)”. The objective should be to make the interface as unobtrusive as possible and to facilitate engagement with the learning content with minimal impedance (“excise”) from the interface (Cooper, Reinmann, & Cronin, 2007, p. 224). Holding the iPhone in one hand and using my thumb to tap was by far the most comfortable option: [diary entry] “much prefer using in one hand in portrait mode”. This is in contrast to Knovikoff’s (2009) design preference for a two-handed landscape orientation approach using both thumbs. On a positive note, there was a ‘settings’ facility which allowed some control over presentation: [diary entry] “turned off L1 (English) voice, (which is) pointless”. It would not be possible to claim that this research fills any major lacuna, but arguably it does provide some insight into the experience of using a mobile app for language learning; however, because the experience is that of one person, and analysed and reported by the same person, one has to therefore exercise caution in deciding what findings could be generalised to others. O’Malley and Chamot (1990) note that the degree of language learning expertise is a factor that can influence the use of strategies. Ellis and Sinclair’s (1989) seminal work illustrates how learner training can be incorporated into language courses. Both Folse (2004) and Thornbury (2002) acknowledge that learners can benefit from strategy training (e.g., mnemonic and key word training), and so it would seem sensible if training in the kinds of vocabulary strategies identified by Oxford (1990), Schmitt and Schmitt (1993) and Gu (2003) could be integrated into vocabulary learning apps. As well as temporal prompting (as used in spaced rehearsal), geospatial prompting could be investigated as a complementary parameter. Because devices such as the iPhone are location-aware, it would be feasible to set triggers based on geographic position. For example, the app could prompt the user to initiate a learning session when they returned home, thereby relieving the learner of some of the burden of learning management. This could be further refined to include a temporal dimension, e.g., when arriving home after 18:00 but before 20:00 in the evening. The fact that the app was amenable to casual use while the user was engaged in other tasks (e.g., on sofa while watching TV) probably increased the frequency of use – the phone is typically always nearby/at hand and available for immediate use (a key differentiator compared to other media/modes of delivery). Motivation to persevere is a key issue with this kind of word card learning. Belshaw (2010) refers to the “ability of mobile technologies to make learning experiences more inviting, engaging and accessible” (p. 31). There would certainly appear to be scope for a greater variety of interaction types, rather than simple yes/no responses. It also became apparent that some kind of reward system is necessary, as used in games. This is an area that certainly deserves further investigation, structuring the vocabulary learning experience so that it becomes more game-like. The app was mostly used at home rather than on the move (e.g. on a bus or train, in queues, etc.). I typically used it either in the morning before work (e.g., over breakfast) or after work. Sharples (2010) notes the challenge of getting close to subjects when researching mobile learning. This is understandable: I would have been an elusive subject for direct observation by others, so autoethnography provided a solution here. This autoethnographic approach could be taken further with a designer/developer/researcher working iteratively to create a resource using feedback from their own learning experience. Perhaps the overriding message derived from this experience was that it is easy to forget how hard foreign language learning can be, particularly at the beginning stages. It could be argued that such an experience should become an integral part of the (continual) professional development of language learning materials developers and designers. I would agree with Davies (2002), who states that “it is precisely in this process of interaction between ethnographer as self and ethnographer as other that social knowledge of general interest and significance is produced” (p. 189). Mark Osborne is a director and co-founder of L2 (www.L2.co.uk), an ELT e-publishing company and the jonMoat consultancy (www.jonMoat.co.uk). He is a PhD candidate on the Doctoral Programme in E-Research and Technology Enhanced Learning at Lancaster University, UK. His professional and research interests include technology-assisted vocabulary learning and the use of iPads in ELT. Cooper, A., Reinmann, R., & Cronin, D. (2007). About face 3: The essentials of interaction design. Indianapolis, IN: Wiley. Davies, C. A. (2002). Reflexive ethnography: A guide to researching selves and others. London, UK: Routledge. Ellis, E., & Sinclair, B. (1989). Learning to learn English: A course in learner training (Teacher’s book). Cambridge, UK: Cambridge University Press. Etherington, K. (2004). Becoming a reflexive researcher: Using our selves in research. London, UK: Jessica Kingsley. Knovikoff, T. (2009). Flash of genius: SAT vocab. In D. Mark (Ed. ), iPhone user interface design projects (pp. 111-126). New York, NY: Apress. Ros i Solé, C. (2010). The fleeting, the situated and the mundane: Ethnographic approaches to mobile language learning (MALL). In G. Vavoula, N. Pachler, & A. Kukulska-Hulme (Eds. ), Researching mobile learning: Frameworks, tools and research designs (pp. 137-150). Bern, Switzerland: Peter Lang. Schmitt, N. (2000). Vocabulary in language teaching. Cambridge, UK: Cambridge University Press. Schmitt, N. (2010). Researching vocabulary: A vocabulary research manual. London, UK: Palgrave Macmillan. Schmitt, N., & Schmitt, D. R. (1993). Identifying and assessing vocabulary learning strategies. 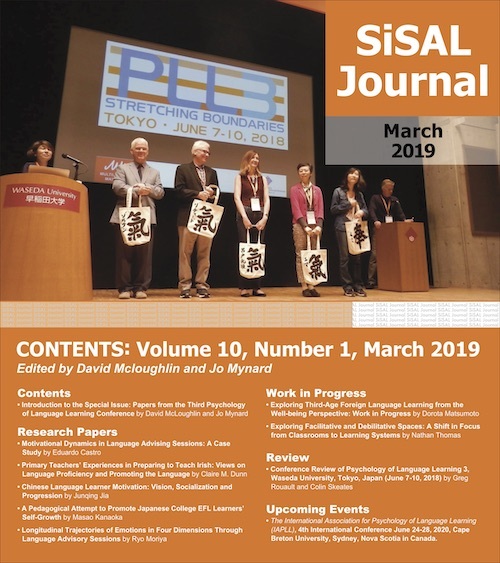 Thai TESOL Bulletin, 5(4), 27-33. Sharples, M. (2010). Methods for evaluating mobile learning. In G. Vavoula, N. Pachler, & A. Kukulska-Hulme (Eds. ), Researching mobile learning: Frameworks, tools and research designs (pp. 17-39). Bern, Switzerland: Peter Lang. Sökmen, A. J. (1997). Current trends in teaching second language vocabulary. In N. Schmitt & M. McCarthy (Eds. ), Vocabulary: Description, acquisition and pedagogy (pp. 237-257). Cambridge, UK: Cambridge University Press. Thornbury, S. (2002). How to teach vocabulary. Harlow, UK: Pearson Longman. Vavoula, G., Pachler, N., & Kukulska-Hulme, A. (Eds.). (2010). Researching mobile learning: Frameworks, tools and research designs. Bern, Switzerland: Peter Lang.